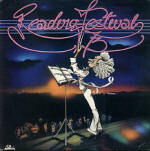 It was a long and frustrating wait, but Magpie Direct finally delivered my copy of the “Reading Festival ’73” CD today – with Lesley Duncan doing a live version of “Earth Mother”. It’s not often I buy a CD for just one track. The others are by Rory Gallagher, Strider, Greenslade, Status Quo, The Faces, Andy Bown and Tim Hardin – not a bad representation of rock music in the early-70s. Most of the artists were connected to London’s famous Marquee Club or managed by Billy Gaff of GM Records, which LD moved to after her first two CDs on CBS. The live version is broadly similar to the studio version, with presumably (there aren’t any credits) Horowitz on keyboards and Chris Spedding on guitar, but I suspect a different drummer; the drumming is tighter and more aggressive than on the original. Some day I’d like to hear a sparser version, with piano instead of electronic keyboards, and a stroppier guitar – but Horowitz seems to have liked lush instrumentation, even live. It’s a more powerful rendering; LD’s vocals are much more assertive throughout, particularly in the choruses – so much so that she’s a tiny bit off-key with some of the line ends “stop.. rot… got… track… black… back” (it’s actually really difficult to sing a staccato word perfectly in tune) – but her singing rings with authority. (Remember, live performances terrified her; read her comments in the CD notes of SCS!) She puts in a nice tremolo-waver on a few words, which isn’t in the original, and which sounds good. The contrast between sheer raw power and sad tenderness in the alternating final choruses is superb. The most startling difference – which works brilliantly – is at the very end of the song. Instead of the fade, thunder, bells and segue into “By and bye” she sings “And we can’t turn and say Stop” – and stops dead. Stunning. Anyone wanting to get hold of the “Reading Festival ’73” CD, it’s on the See For Miles label (SEECD 343) at £10.99, and is available from their distributors Magpie Direct: tel +44 (0)8700 711 611, fax +44 (0)1784 241168, email orders@highnote.co.uk . It’s not in their catalogue, and they told me they have “just a few copies left”, so this might be your last chance to get hold of one. But I should warn you that they were incredibly inefficient, managing to lose my order four times before finally sending me the CD.